Use EdbMails OST to PST converter tool. Recover corrupted OST file and convert OST mailbox data to PST file. You can import the exported PST to Exchange server using Power shell. Using EdbMails OST to PST conversion tool. Convert OST to PST file. Than import the recovered PST file to live exchange server. Have a backup of PST file from OST file. Free OST file viewer: you can open OST file and preview all data of OST file. View all emails contacts, folders, calendar like outlook. Verify all the mail items and its contents with free version of OST to PST tool. Backup Exchange mailbox by exporting OST to PST file. Export OST file to PST and have it backup on regular basis. In case of Exchange Server crash. You can restore all mailbox PSTs to Exchange server. 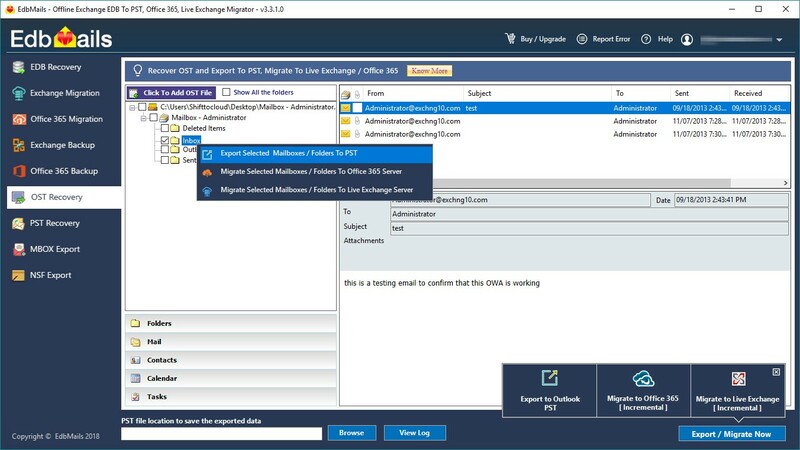 EdbMails OST to PST allows you to do direct migration. Migrate your data to office 365 or Live exchange server. Allow impersonation rights to one of the user of office 365 or live exchange server. Login with user in EdbMails OST to PST converter application. 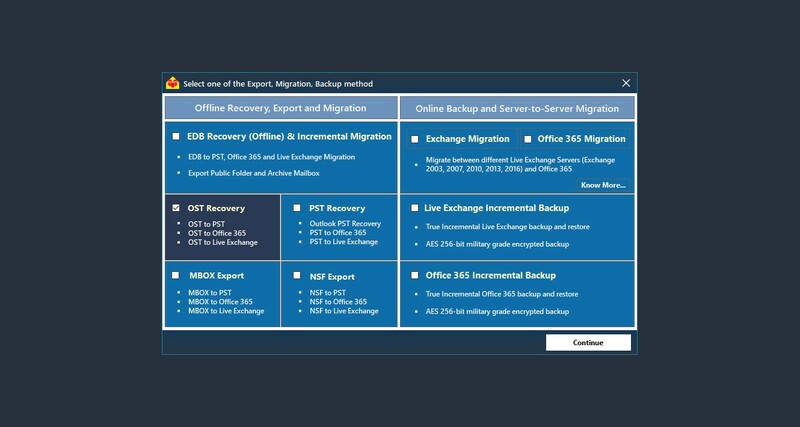 Map the OST file to office 365 or live Exchange server account to Migrate. EdbMails allows you to access OST file from network location. You can choose any OST file from your network to convert OST to PST file. EdbMails converts OST to PST file. Any version of Exchange server OST and Outlook. No matter which version of Microsoft Outlook you are using. Select the required folder in OST file and export OST to PST. You can export only contacts or Calendars or you can filter the export based on dates and subject. EdbMails recovers all attachments and in-line attachments contained in OST file. OST to PST recovery tool keeps the originality of the mail body without making any changes to it. OST to PST Converter recovers the emails with the meta data. Recover the data like ‘subject’, ‘to address’, ‘from address’, ‘date and time’, ‘cc’, ‘bcc’, 'message id' etc from outlook data files. Saves background images, attachments (with all extensions), appointments, meeting schedules etc. Convert orphaned OST files to Outlook PST file using EdbMails OST to PST converter tool. You can convert OST file that is not attached or linked with Outlook or to Exchange server. Free OST to PST converter will be able to convert up to 30 items from each and every folders maintaining the exact source Mailbox folder hierarchy. 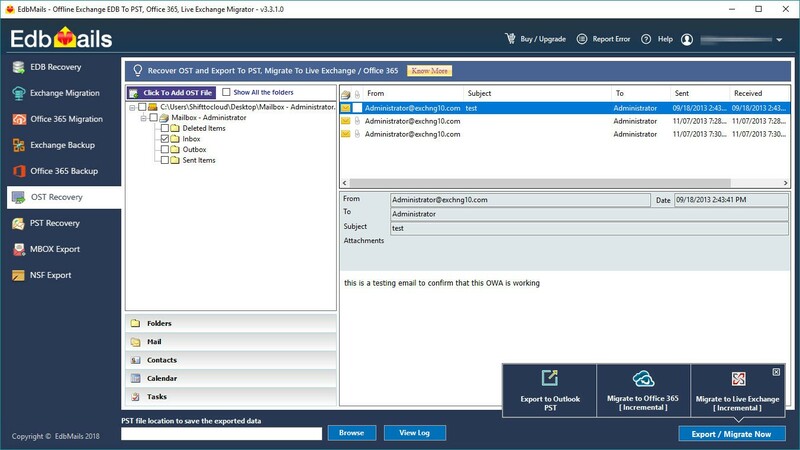 You can perform migration of OST file data to Office 365 and Live Exchange Server directly. EdbMails OST to PST conversion can resolve the issue cased by Exchange server. In situation like Exchange server downtime, deletion of user account, Exchange server crash, your mail data will not be accessible. In that case you need to convert OST to PST file. Your mails, attachments, contacts, appointments, task, notes etc can be viewed in outlook after OST to PST conversion. 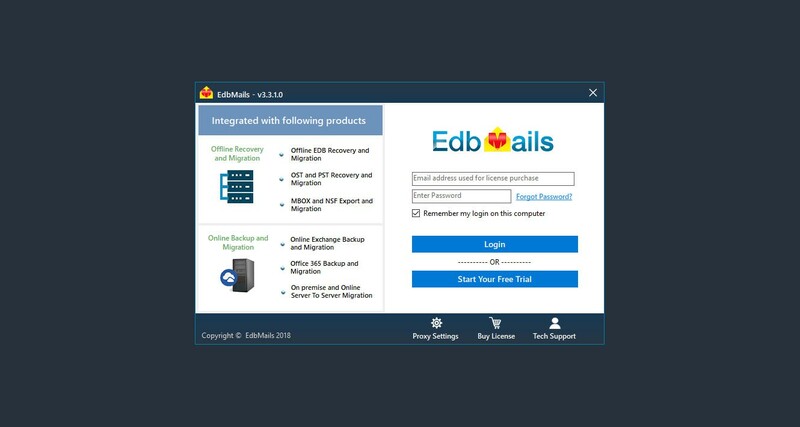 Use EdbMails OST converter application to backup data as a PST file in case disaster recovery. Also, for fully customization Exchange backup, see our EdbMails Exchange backup and Office 365 backup software. No technical knowledge is required for performing OST recovery, OST to PST conversion and OST Migration with EdbMails. Thanks to its user interface which is rather straightforward and simple to use. The OST file conversion can be done with couple of clicks. EdbMails supports with the power of granular brick level recovery of OST file. This helps you to export selective Mailboxes / Folders to PST with intuitive GUI. Support you to filter the OST file data by sent/receive date, subject, and attachments name and from and to addresses. Import and export OST files, data from and to Microsoft Outlook, Exchange Server, and Office 365. The Free EdbMails OST Converter tool version allows you to migrate 30 items from each folder. Step 3: Preview mailbox of OST file, select the mailbox to export to PST. Step 4: Export selected mailbox or folders to PST. How to convert OST to PST using EdbMails free OST to PST Converter?